NOTE: This content is old - Published: Saturday, Nov 24th, 2018. A major contract to develop a new innovative reconnaissance system has been won by QinetiQ – with Glyndwr Innovations Ltd contributing to the programme. The contract was awarded by MoD and the UK Defence Solutions Centre (DSC) after QinetiQ were named among the winners of the MOD and Defence Growth Partnership (DGP)’s Innovation Challenge. Staff from Glyndŵr Innovations were among guests at an official launch at the Institute of Engineering and Technology where the winners were announced. The development team comprises Glyndŵr Innovations, Airbus and Thales, and will be led by defence technology company QinetiQ. 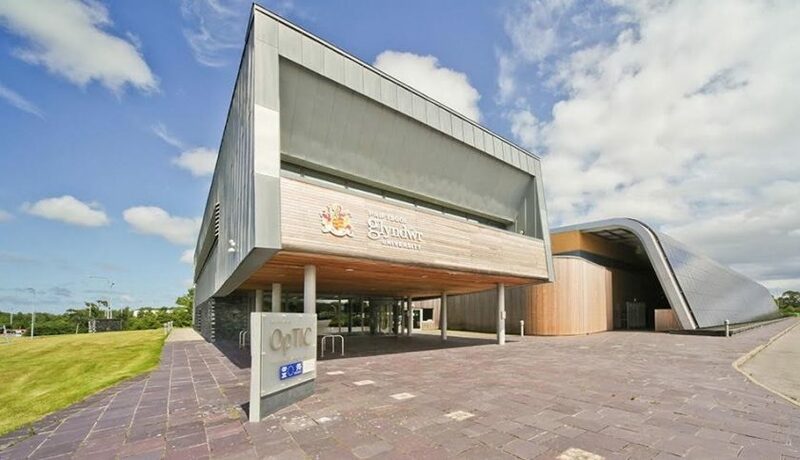 Glyndŵr Innovations is the commercial arm of Wrexham Glyndŵr University’s world-leading research division based at the Optic Technology Centre in St Asaph. QinetiQ were chosen as winners, and have incorporated Glyndwr Innovations to provide an innovative solution to key strategic future demands for UK defence. The winning project will see Glyndŵr and QinetiQ working together to combine their winning entries from previous phases of the competition to form a complete operational flight ready system – which will be made up of Glyndŵr Innovations Ltd’s Ultra Lightweight Telescope and QinetiQ’s SDML system. Glyndŵr Innovations Ltd’s specialist skills in optical systems led them to develop an Ultra Lightweight Telescope was designed to provide HAPS ( High Altitude UAVs) with an instrument capable of high resolution ground imaging from as far as 23km. The telescope – dubbed Gwyliwr (or Watcher) – had already picked up a trophy as Best New Product at the 2017 Business Insider Awards. SDML is a variant of LIDAR, a technology which works like radar, but instead of using radar, uses light. SDML (Software Defined Multipurpose LIDAR) allows the user to switch between different operating modes during operation. Modes could include 3D mapping, vibrometary (detecting vibrations) and secure optical communications – with the point to point nature of optical communications making them very difficult to intercept. The system will provide airborne platforms with new versatile intelligence, surveillance and reconnaissance (ISR) capabilities as well as secure, high bandwidth optical communications between land, air, sea and space. The contract to develop the new product will run for two years, with airborne and shipborne trials planned at its conclusion. Glyndŵr Innovations Ltd’s Sales Engineer, Richard Hazelwood, said: “We are delighted to have been part of the winning team for this project. Developing this technology will mean taking some of the high-level research we have been doing here at Glyndŵr Innovations and turning it into a market-ready product. Director of the OpTIC Techology Centre, Caroline Gray, added: “This is the latest in a series of high profile industrial collaboration projects within the OpTIC Technology Centre.